GoSustaino: Reduce, Reuse, Receptacle, eh? Ahh!! Memorial day weekend is coming soon. Time for grillin' and making garbage. Between all the plastic hot dog bags, sporks, and beer cans...ever wonder where that garbage really goes? Well, the city of Lakewood has been doing some pre-planning when it comes to recycling. If you missed some of the activities around Earth Day there is a new kind of receptacle on the streets of Lakewood along Detroit and Madison Avenue. 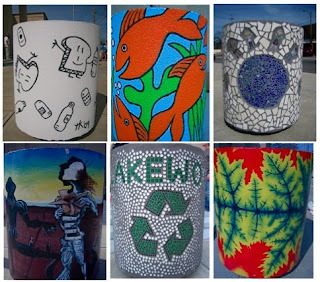 Local artists were called upon by ecoLakewood, a volunteer group that works with City Council to help beautify Lakewood and implement sustainable practices (e.g. recycling, farmers markets, community gardens, and CSA programs). As part of a trendy “green smART” community project, the “Art of Recycling" contest was held on the front steps of the library. The goal was to creatively design a 55-gallon bin that would encourage recycling in the community. Green Smart Gifts, Local Girl Gallery and Lakewood is Art selected eight artists, provided them a $150 stipend to cover the costs of materials and time, and viola! While seven bins might not be enough (evaluations are being tracked) - it is a step in the right direction.